This George III silver salt, with gilded interior, was made by Daniel Pontifex in London 1800. 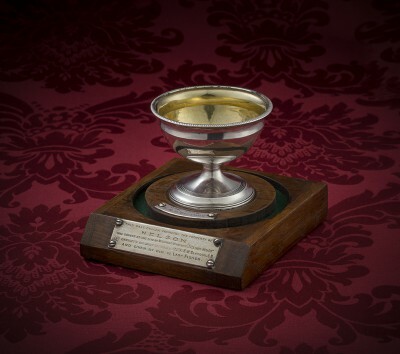 It belonged to Admiral Lord Nelson and probably formed part of a service of silver he purchased after the battle of Copenhagen in 1802 using funds granted him by Lloyd’s Coffee House. 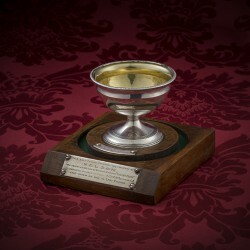 Pontifex also supplied the Copenhagen service with silver sauce tureens –two of which are in the collection of the National Maritime Museum, Greenwich whilst a further pair were sold at Sotheby’s in 2005 from the collection of Nelson’s sister Kitty Matcham – as well as a pair of matching boat shaped salts. This example, mounted on oak from HMS Victory, was sold at the celebrated Bridport auction at Christies in 1895 when Nelson’s magnificent collection of trophies, medals and silver – inherited by his niece Charlotte who married Lord Bridport – were dispersed. Following the auction, the salt was gifted to Lady Fisher wife of the famed admiral and first sea lord John “Jacky” Fisher (1841-1920). 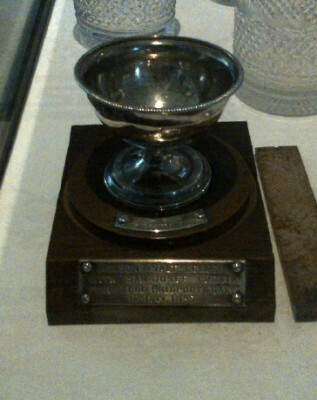 A pair to the salt, similarly mounted, is on display at the Museum of the Royal Navy, Portsmouth.